Could the successor to the DM800 HD be the world's smallest self-contained PVR? Just over two years ago, Dream Multimedia launched its DM800 HD – a hi-def receiver into which a 2.5-inch hard drive could be fitted, thereby turning it into a single-tuner PVR. We were reasonably impressed with the overall functionality of this compact unit, which occupied much the same volume as a large paperback. Running the popular Enigma2 firmware, its replacement capitalises on two years of technology progress. A key difference to its predecessor is that the processor has been upgraded from 300MHz to 400MHz, which should aid responsiveness. The OLED display has been upgraded to colour, and you now get a 'true' HDMI port instead of DVI. In other respects, the two receivers are very similar. The DM800 HD SE is slightly larger than its predecessor (225mm x 145mm x 52mm) although both are rounded off with near-identical glossy frontages. As only a standby button is provided, you'll need the UEI-made handset (which is also compatible with many brands of TV) to operate the unit. The presence of that tiny display, which is bright but can only be read close up, does allow you to sequence through radio stations without having to power up your TV. Under a flap is the twin card-reader – which, by default, supports the Dreamcrypt conditional access system. With different firmware or plug-ins it could support different CAMs; no CI slot is present. The DM800 HD se is powered by an external 12V mains unit. An advantage of this separates approach is cooler running, and that the receiver could be powered from a suitable 12V DC source – a moot point for travellers. That said, there's a quiet top-mounted cooling fan whose running speed can be changed in the setup menus. The single tuner, as before, is pluggable. You get a single DVB-S/S2 tuner which can be replaced with a digital terrestrial or cable one. Indeed, Dream supplies a replacement rear-panel for this very eventuality. What a pity that the included satellite tuner lacks the loopthrough output of the original DM800 HD – that surely ranks as a downgrade? The limited rear panel space bristles with connectivity. It's possible to switch the (single) Scart output between composite, S-video, component (up to 1080i) and RGB – all accompanied by stereo audio. Then there's HDMI, which is recommended for the best results with modern displays. In addition to the usual modes (720p/1080i – no 1080p here) are resolutions optimised for PC monitors. If for some reason you don't want to install a hard drive inside the machine, operation with external drives is allowed. To this end, we're provided with an external SATA (eSATA) terminal and two USB ports (the latter cannot be used for recording). A third mini-USB port is intended solely for 'service' functions like firmware upgrades – the RS232 port of the old DM800 HD is gone. Finally, we have Ethernet, an analogue modem jack and a digital audio output. Installing a hard drive is a five-minute job – not least because only a single power/data connector needs to be plugged into your 2.5-inch SATA drive, which screws to an internal bracket. As mentioned, the DM800 HD se is pre-installed with the Enigma2 firmware. A series of wizards painlessly guides you through the process of installing the receiver. They cover language, TV system, time zone, initial dish/DiSEqC configuration and searching for channels – all parameters that can be modified later if desired. A key advantage of the Dreambox/Enigma approach is its plug-in architecture. There are many of these, serving a range of different applications. Among those included out of the box is a handy test-pattern generator to help you optimise display contrast and brightness. Another is dedicated to positioners. Indeed, the DiSEqC capabilities are good; in addition to 1.2, this receiver supports USALS and simple 1.0 switchboxes. All of the usual controls for dish movement are present. Searching can cover single transponders or complete satellites – you can also tell the receiver to search for all channels or just FTA ones. There's also an included satfinder plug-in that boasts large signal strength/quality bar graphs for the chosen transponder. Manual searching facilities are somewhat sparse; although FEC can be modified, Enigma2 doesn't allow PID entry. Also regrettable is the lack of blind search. It's a pity that no plug-in yet exists for this. Automated multiple-satellite searches are, however, permitted. Other menus cover different aspects of configuration. In the AV menu you can choose various resolutions, refresh rates and aspect-ratio defaults – lip-sync, audio modes and upscaling sharpness are also adjustable here. Then there are functions like parental-control, plug-ininstallation, user-interface customisation and readying (formatting) the HDD for recording. As with other Enigma-based receivers, channels are arranged in lists known as bouquets. These are accessed in a channel selection menu, from which the list can be sorted alphabetically, by satellite/provider bouquets, or 'favourites'. It's easy to modify bouquets according to preference. After selecting a channel, pressing the 'info' button yields an EPG-derived description of the current programme. A cool feature here is that you're alerted to 'similar broadcasts', depending on the available EPG data. Talking of which, an EPG (another plug-in) which supports now-and-next and seven-day schedules, is also accessible from here offering two modes. The first focuses on one channel's schedule, while the other allows you to see what multiple channels are offering within a given time slot. If the relevant EPG data is in the machine, the name of the programme currently being broadcast by the channel is presented adjacently – together with a running-time 'bar graph'. Recordings can be scheduled via the EPG – manual timer programming and 'instant' recording are offered as alternatives. With one tuner on board, you can watch and record different channels provided that both are on the same transponder. In the channel list the restricted number of available services are highlighted. Not as flexible as a full-blown twin-tuner PVR, but worthwhile, nevertheless. When a recording is in progress you can view either this or an existing one – the 'video' button displays the list of available recordings. Timeshifting is engaged by pressing pause; playback can be resumed at your convenience, and the transport controls used to skip ads. Another of the included plug-ins is a powerful media player. Content stored on USB media can be played – or you could transfer multimedia files across to the HDD via FTP. Another plug-in adds network browsing/file streaming. It may be compatible with a wide range of content that includes DivX/XviD, MPEG, mkv/x.264 and MP3 audio, but the media player isn't perfect. Some content doesn't fill the screen because it's being displayed at native resolution, and there's no zoom function. Quite unintuitively, a separate 'PicturePlayer' plug-in is required for photos. Moving back to the positives, another key advantage of Enigma2 is the web interface plug-in. Channels can be remotely selected from here – you can also start or stop recording, access EPG info and schedule timer events. If you have VLC Media Player installed on your computer, then you can remotely view the currently tuned channel in a window. Existing recordings stored on the external HDD can also be streamed or downloaded via the network – even while the machine records another programme. Other plug-ins cater for a wide range of possibilities. Among them are YouTube, internet radio, video editing, Google Maps and AV sync adjustment. 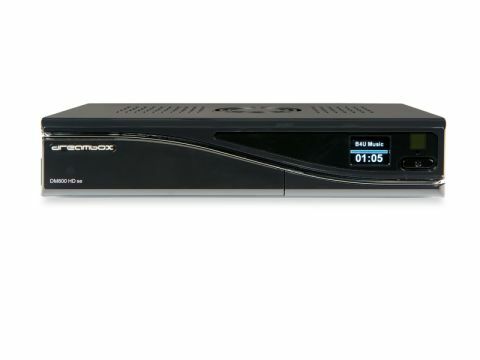 However, we couldn't manually install any from the relevant 'manage extensions' menu and none of the currently available plug-ins will synchronise the receiver's clock to a user-defined TV channel or internet time server. That's a pity, because the review unit's clock ran so spectacularly fast that its timer was close to useless. It gained a shocking 20 minutes overnight! Shoddy timekeeping, recalcitrant plug-ins and media playback scaling issues apart, the DM800 HD SE performed well. As with the DM500 HD, the tuner reliably held onto channels from Astra 1x and Hot Bird. Not much of an issue, you might think, but the test in question involved a 45cm dish, multi-LNB and weather that was less than ideal. The user interface, menu system and channel selection were all found to be very responsive – a benefit of the faster processor. Searching was reasonably fast, although there were occasional pauses. We suspect that there's a connection with DVB-S2 services here. AV quality, from SD and HD channels, is excellent – especially via HDMI.